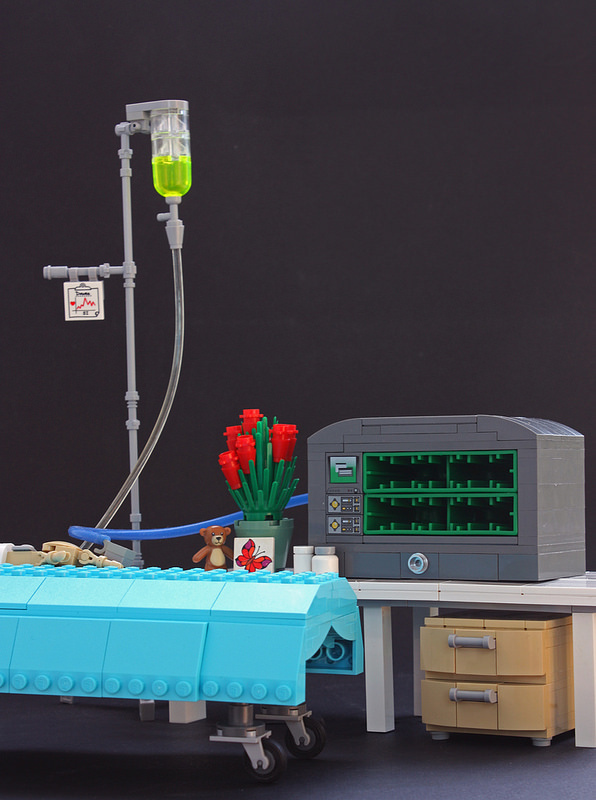 You can almost smell the clinical environment and hear the beep… beep… beep of the heart monitor in this hospital-themed build by Finnish builder Eero Okkonen. The IV bag hanging from the drip stand seems to contain the infamously yellow vitamin B infusion with a tube leading down to a rather frail looking hand on the bed. The pulse oximeter is hooked up to a large monitoring machine with a glowing display. Additional details like the “Get Well Soon” card and a couple of bottles of tablets are a lovely touch. What is particularly impressive about this build is the ingenuity of the part that Eero used as the screen display for the monitor — it’s actually the underside of the current seed part in this round of Iron Builder, namely the Duplo part Fire/Grass/Ice 1x4x2.